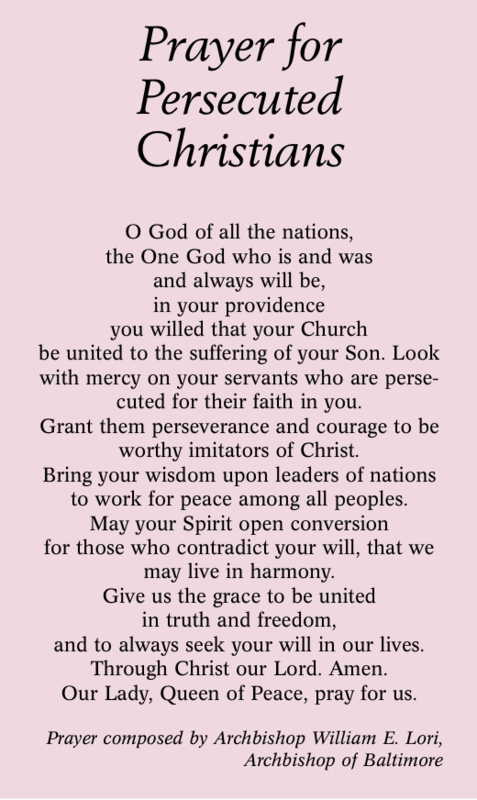 The Bishops of the United States (USCCB) have designated this Sunday, the Feast of Christ the King, as A Day of Prayer for Persecuted Christians (see below). As we look at our world scene today, we recognize that the persecution of Christians around the world perhaps has never been more intense since the days of the early persecutions during the Roman Empire. It sounds hard to believe in 2017, however, it is true. The situation in the Middle East especially is very troubling. The Christian population of Iraq exemplifies the effects of war on a religious minority. Historically, the Christians in Iraq played a substantial role in balancing the situation between Muslim groups and other minorities. The size of the Christian population, however, has dwindled to perhaps 10 to 20 percent of what it had been before the current war. In Syria, we see a country with over half of its population turned into displaced persons or refugees. Syrian Christians represent about 10 percent of the Syrian population and they are equally distributed among the displaced and refugee populations. In Egypt we see that the Coptic population of Orthodox and Coptic Catholics all face difficult days. The situation has been somewhat ameliorated, however, the attacks on Christians continue in that country. Even in the Holy Land we see political conflict between the Israelis and Palestinians continue to fuel a grim daily humanitarian situation for the Arab Christians, especially those in East Jerusalem and the West Bank. The direct attacks by ISIS on Christians have proven to be one of the major genocidal movements of the present century. Persecution takes many forms, some of which are the direct killing of Christians simply because they are Christians. Other forms result in the confiscation of their property, their displacement from their homes and the loss of their ancestral places. We must remember that Christians inhabited the countries of the Middle East before the advent of the Muslim religion. All of these places are in a certain sense part of the land of the Scriptures, going back to the Jewish presence before Christians in Iraq and Syria in particular. History, however, has a way of repeating itself and we recognize that the present-day displaced populations are in need of our assistance. Certainly, we must honor in our prayers those who have faced true martyrdom. There are many organizations that are assisting these persecuted Christians, those who have fled and those who have tried to remain in their ancestral homes. Aid to the Church in Need, an international papal foundation, based here in Brooklyn; The Catholic Near East Welfare Association, based in the Archdiocese of New York; Catholic Relief Services; and the Knights of Columbus are all organizations at the forefront of assisting persecuted Christians with financial and emergency relief. Also, all of these organizations are capable of assisting and maintaining some equilibrium for the embattled Christian communities. It is important to understand exactly who these Christians are. Besides the Orthodox, there are the Eastern Rite Catholics who are a part of our Church who have been particularly impacted. In addition, there are the Maronites, the Melkites, the Armenians, the Chaldeans, the Coptic Catholics, the Syrian Catholics, and the Roman Catholic Church (Latin Rite) represented in these countries. Our brothers and sisters in Christ all have found a new solidarity in their suffering. The theme of this Sunday’s Day of Prayer for Persecuted Christians, Solidarity in Suffering, is that we too will find solidarity in suffering with them, coming to their assistance not only through material support, but especially through our prayer. As we pray the prayer, which you see on this page, we understand it is something we can do for these persecuted Christians which joins us in solidarity with them. As we conclude our Thanksgiving weekend, a time when we gather with our families to give thanks for the blessings we have received during the past year, we pray that these persecuted Christians will be free to pray and gather as families in their homeland as we are able to do with ours. We join with them in solidarity and prayer in the moment of their persecution. St. Augustine said, “The Church progresses on her pilgrimage amid this world’s persecutions and God’s consolations.” (CCC, 769) How true these words are today as they were when St. Augustine first spoke them in the Fourth Century. As Christians in this world, we find ourselves constantly under siege either physically or morally. We still have the consolation of God, however. We too must become consolers and put out into the deep in assisting others in their time of need. To find out more about this current persecution of Christians and how you might offer your assistance, the USCCB has set up the following website (www.usccb.org/middle-east-christians). We thank God for the opportunity to assist other Christians who are facing persecution because of their faith.